Life on Center: What's Cookin'? I was inspired by Nate's sister, Anne, to start weekly meal planning in January 2012. I also felt guilty suggesting meal planning to patients while not doing it myself. In Madison, Nate's slate-sided cabinets were the perfect place for posting our "good eats." Now that we're renting, the best I can do is a tear-off pad stuck to the refrigerator. Further inspired by a new moms' group friend who gave a talk on meal planning, I decided to start posting our weekly menus on this new page. My hope is to archive our menus so I can revisit them when I need ideas. I also want to share ideas with you, if you want them, and share good recipes, when I come across them. Maybe eventually you can share ideas with me. We love leftovers and usually eat them for lunches. If we have extra, I don't have to cook! Friday: Beef chili in the Porcupine Mountains! Saturday: Nachos with queso, ground beef and ALL the fixings! Wednesday: Ramen with chicken and all the fixings. Yum. Thursday: Qdoba en route to Washington D.C.
Saturday: Alicia & Nate to the Netherlands! Wednesday: Oma made fried rice. Thanks Oma! Week of July 10 - Somehow this week escaped my memory and my records! Monday: No memory of it! Monday: Out to Monsoon Siam to celebrate the closing of ALL of our permits!! Wednesday: Vietnamese grilled pork and cold rice noodles...YUM! Saturday: Birthday celebration for Peter! Oranges, chips/salsa, cheese/crackers and 2 cakes! Friday: I ate leftovers while the girls and Nate ate hot dogs and s'mores at their campsite! Thursday: Hospital food! Yay...Peter is here! Saturday: Apple holiday party at the California Academy of Sciences - great food! Sunday: Flight to Milwaukee and late dinner (barley, bean & chicken chili) in Madison. Thanks Marcia! Tuesday: Out to Stone Brewing Co.
Monday: Thai take-out (green curry, drunken noodle, green papaya salad & pad thai); chocolate cake for birthday dessert! Saturday: New York French Fries & leftovers from Friday's "picnic"
Sunday: Brie & pear sandwich on raisin/walnut bread with grainy mustard and watercress. So good that I made a point to remember the combination because it would be a fun sandwich to make at home! Friday: Wonderful potluck at Doran's for a Fourth of July celebration! Friday: Pesto pizza with sun dried tomatoes, mushrooms, artichoke hearts and goat cheese with roasted broccoli; Chocolate pie for Cora's birthday dessert! Thursday: Nate cooked; I went out to Aqui for a MOPS mom's night out! Thursday: Dinner with ALL the cousins (Axel, Marin, Cora, Oliver, Louisa, Cohen): loaded salads (chicken, roasted broccoli, peppers, olives, dried cranberries, cucumber, red onion and croutons) with butternut squash soup. Friday: Homemade pizza and salad with Cizeks! Thanks Paul! Saturday: Out to Zameen: my new favorite restaurant! Friday: Out to BlueLine Pizza after trick-or-treat with Schlegals! Sunday: Birthday party for Pam & Brian at LG Brewing Co.
Friday: Date night at Opa! Sunday: Small group meeting at Smith's: we brought apple slices...wow, pretty fancy! Saturday: BLTs on homemade bread, my first loaf of bread ever! Friday: On the road to Santa Barbara...Taco Bell!?! Friday: Celebration dinner offered to new parents - decent food, except for Nate's roast that was claiming to be rib eye or some other fancy cut of beef. Wednesday: Leftovers...I promise, I wasn't being lazy, we just had a lot of leftovers! Friday: Eggplant Parmesan with bow-tie pasta (you know, to induce labor...) Thanks Mom! Week of March 25 - a week for "kitchen nesting"...making doubles of the casserole-type dishes for our freezer! Monday: Mexican lasagna with pinto beans and chicken thighs, avocado, sour cream and salsa. Jicama & yellow pepper salad too! Friday: Hmmm...sick week...can't remember what we ate this night. Sunday: 2-two year old birthday parties in one day! Plenty of food to fill our stomachs. Friday: "Food Court" dinner at San Pedro Square Market. I had a great beef bourguignon from Sama Zama! Saturday: Pre-baby Ladies' Night Out at Hay Market. I had a "The Vegan" and it was fantastic! Wednesday: Back home in Campbell! Managed to scrounge ingredients for this tasty chicken soup! Wednesday: Tortilla Soup with chicken, yellow pepper, carrots and celery added...great for a bag mix! By the way, who knew you could buy food on Amazon? I didn't, just put the link so you could see what brand it was. Thursday: Fusilli pasta with Trader Joe's tomato-basil marinara. For health's sake, I added onion, broccoli stems, carrots and orange pepper. Sunday: Grilled steak & chicken, roasted potatoes, spinach/avocado/strawberry salad (Thanks Suzanne and Brad!). Lemon sorbet, made from lemons on our tree, for dessert! Sunday: Too full from lunch at Cempazuchi in Milwaukee! Thursday: Grilled turkey, roasted Brussels sprouts, cranberry sauce, mashed potatoes, gravy, dressing, sweet potatoes, pumpkin pie, French silk pie. The hit of the night was the stuffing/dressing...Nice work Nate! Sunday: Supreme pizza, Christmas music and Christmas tree trimmings! Friday: Nate was on his own all weekend...Louisa and I took off for Wisconsin on Friday morning! Thanks for all of the meal ideas. 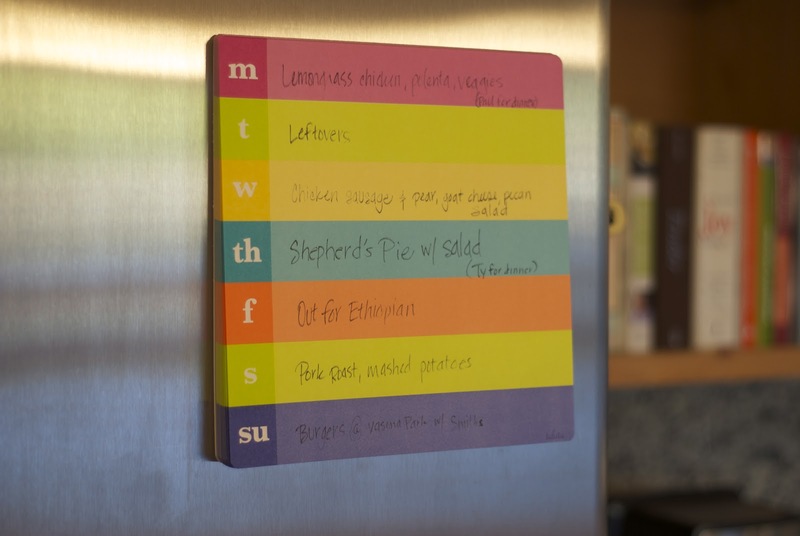 We now do our weekly meal planning, inspired by your meal board :) I guess I should thank Anne for that. Our meals this week include: Philly Cheese Steaks, Chili, Cobb Salad, and tacos. Thanks again and we look forward to stealing some ideas.